Suitable for Shimano card type flywheel lock ring and disc brake ring (central locking type drum), CRV material, cold heading precision is not easy to wear tool and damage flywheel. The direction of the removal of the fly cover is just the same as that of the flywheel spin, by this way it can be fixed so that it can be removed smoothly. The tool works very well. The handle is longer and the force is better. The end plastic is antiskid and won't hurt the hand. The front end is also made of medium and high grade chains. It is good to grip and not easy to hurt. Good hand feeling, convenient disassembly, etc., and is especially suitable for bike shop and personal maintenance bicycles. With it, disassembly and cleaning are very convenient and effective. Designed to be used in conjunction with the cassette lock ring tool(not included) to remove cassettes from hubs. 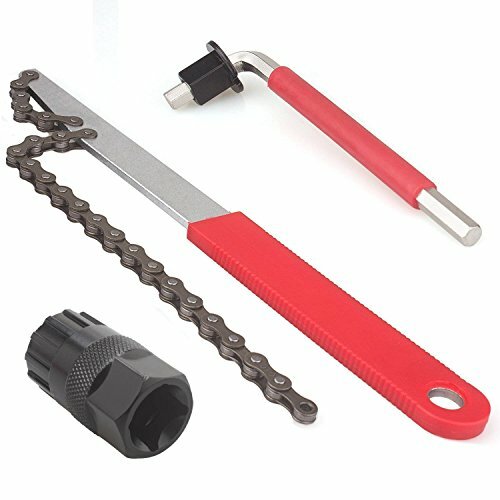 Sprocket Remover can also be used to tighten on screw-on freewheels. Caters for 8, 9 and 10 speed cassettes. When remove flywheel, fixed wheel to prevent from damage. Silver color chain whip with orange non-slip coated handle for comfort and ease of use. It is constructed from steel for durability. It also features hardened pins to keep the chain in place and a comfortable handle. If you have any questions about this product by Luditek, contact us by completing and submitting the form below. If you are looking for a specif part number, please include it with your message.